Five years. I can’t believe it’s been 5 years since we started on the Turn It Teal journey. It seems like a great time to look back (and forward). It all started with the Terminal Tower in Cleveland, Ohio. 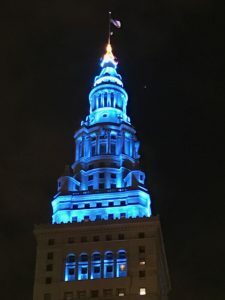 On a whim, I decided to contact them after seeing the iconic Cleveland building lit one night on my way home. I had no idea what I was doing, but I poked around and found out who to contact. It didn’t take long to get a reply and it was a yes. I remember when I told TealHubs and I was practically in tears! That was a big deal for “just” a Mom. 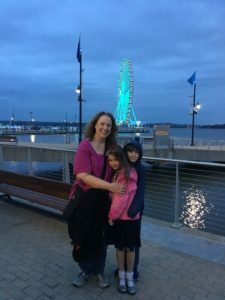 As a walk co-chair and a moderator on web forums, I had already been involved in the allergy community for some time, but this was a totally new thing. I had no idea it was something I would continue doing so year two was a surprise to me. We first had an international lighting, and a Natural Wonder of the World, no less. We decided to take our first trip north of the border for the lighting! Passports in hand, we headed to Niagara Falls. Unfortunately, it was a pretty cold and rainy May night. We tried to get down to the falls to take pictures, but the rains and mist made it pretty much impossible. What did happen on that trip was we got over one more hump. We traveled further by car than we had ever before, and lived to tell the tale. TealKid was also in the throes of one of his worst asthma flares when we went. It was a memorable trip for many reasons. Year three was awesome. We started picking up some steam. The Terminal Tower was still on the list, which we love. It’s where it all started and I love that they have been involved from day one! We had an amazing collection of sites lit. Where in year one, a single building was lit, and in year two, three sites lit, year three saw a total of 23 sites, more than seven times the year before! Last year was our biggest. We hit a fever pitch and had help from all over the world! We expanded beyond North America with help from Trigger Food Allergy Awareness in Australia, and Kids with Food Allergies Jordan. Organizations from here in the US helped out as well (our thanks to The Allergy and Asthma Network, and Food Allergy and Anaphylaxis Connection Team). Our friends at the Canadian Anaphylaxis Initiative teamed up to help us reach even further into Canada joining us for the Falls and CN Tower, Toronto sign at Nathan Phillips Square and Mississauga City Hall. Thanks also to bloggers Tracy Bush-NutriMom and Alli Bahn-Miss Allergic Reactor who helped reach out as well to different sites. While most of our lightings happen in May, there are sometimes outliers. 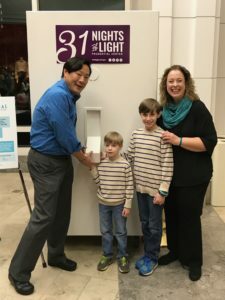 For the past two years, we have traveled to Boston for the lighting of the Prudential Tower during their holiday program “31 Nights of Lights.” This year we were so excited to have Chef Ming Tsai join us to flip the switch at The Pru! It was an amazing trip, and Boston seems to be becoming our home away from home. So here we are in our 5th year. I just want to take this time to thank each and every one of you who have helped by suggesting a site or sending in photos of lightings. For those who have encouraged me personally when I seem to get more “no’s” than yes’s. Thank you to the organizations who have helped spread the word and for those who do all the educating, the research, and the advocacy work that is so important to allergy awareness. As I have said from the beginning, we are just here to shine a light on food allergies and we leave the work to those who do it best, and I will keep doing what I do. Together we can make a difference. Together we can make it happen.